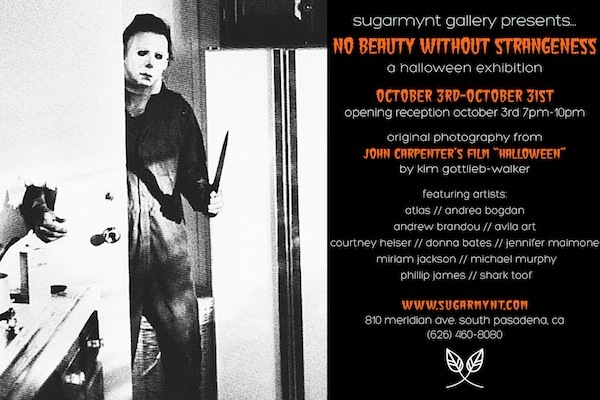 ‘No Beauty Without Strangeness’ Halloween Art Exhibit Coming To Pasadena This Month! Woo hoo! It’s October 1st! Which means it’s time to start getting into the Halloween spirit. And what better way to get into the Halloween spirit, than with an art and photography exhibit revolving around our favorite time of the year? And you know what’s even better about it? It’s located right next door to the original Michael Myers house from the 1978 horror classic, Halloween! The ‘No Beauty Without Strangeness‘ Halloween art exhibition will be running from October 3rd through the 31st in South Pasadena, California. Sorry to my non-Southern California readers (unless you decide to make the drive) for the bad news. This exhibit will feature work from several artists and photographers, including Kim Gottlieb-Walker who was the unit photographer on Halloween and will also be doing a book/poster signing as well. Check out the flier below for more info and Happy Halloween Month, everybody!